Airbus Defense and Space announced the successful landing of its first production aircraft of the Zephyr program, the new Zephyr S HAPS (High Altitude Pseudo-Satellite). After taking off on July 11th in Arizona, Zephyr S logged a maiden flight of over 25 days, the longest duration flight ever made. An application has been made to establish this as a new world record. This maiden flight of the solar powered Zephyr S proves the system capabilities and achieved all the flight’s engineering objectives. The previous longest flight duration record was also logged by a Zephyr prototype aircraft a few years ago, achieving then more than 14 days continuous flight, which already was ten times longer than any other aircraft in the world. This new record flight was supported by the UK government and reflects the U.K. Ministry of Defense’s position as the first customer for this innovative and potentially game changing capability. 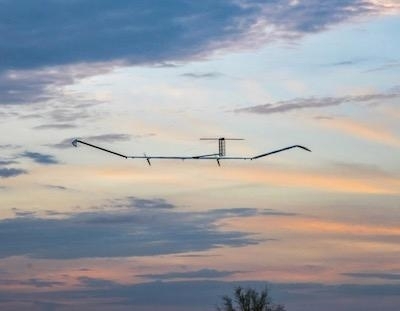 Zephyr is the world’s leading, solar–electric, stratospheric Unmanned Aerial Vehicle (UAV). It harnesses the sun’s rays, running exclusively on solar power, above the weather and conventional air traffic; filling a capability gap complimentary to satellites, UAVs and manned aircraft to provide persistent local satellite-like services. “This very successful maiden flight represents a new significant milestone in the Zephyr program, adding a new stratospheric flight endurance record which we hope will be formalized very shortly. We will in the coming days check all engineering data and outputs and start the preparation of additional flights planned for the second half of this year from our new operating site at the Wyndham airfield in Western Australia” said Jana Rosenmann, Head of Unmanned Aerial Systems at Airbus.